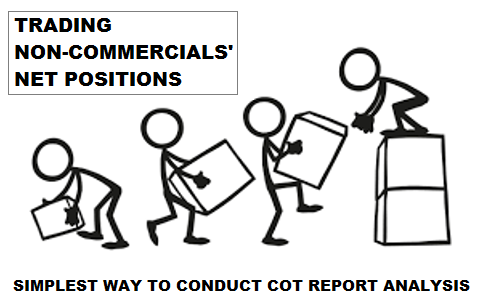 yourFXguide-When we see the short format of COT report, we find two major types of reportable traders that are commercial and non-commercial. The first question that should be moving in smart traders mind is "Why they are reportable traders?" This classes of traders are bound to report their financial market activities to the CFTC. Okay !!! One question is answered, but logically second question arises in mind "Why they are bound to report their financial market activities to the CFTC ?" Before giving the answer of this question, I should introduce the CFTC to the new traders who never heard about this regulatory body. CFTC stands for Commodity Futures Trading Commission that is responsible to regulate the activities of financial market participants. A trader become reportable, if he has power to determine the financial market movements or can affect the market movements. So, commercial and non-commercial traders are the big boys in the financial market. In this post, we are using only the net positions of non-commercial to understand the market sentiment. Non-commercial traders who participate in the financial market to make profits, they are not involved in the production, processing, or merchandising of a commodity, using futures contracts primarily for hedging,unlike the commercial traders. So, non-commercial traders and our desire in the market is same. That is the primary reason most of the traders use non-commercial traders positions data to conduct COT report analysis. So, when non-commercial traders start buying we should also place our buy orders in the market to follow the big boys' steps. How the net positions of non-commercial traders are calculated? The formula to calculate the net positions of non-commercial traders is very simple, just deduct the short positions of the non-commercial traders from the long positions of non-commercial traders.The net position can be positive or negative figure. 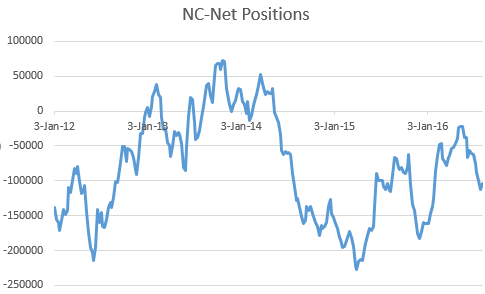 If the net position is positive figure, it indicates that the non-commercial trades are net long. In other side, if the net position is negative figure, it indicates that the non-commercial traders are net short. The above illustration shows one of the ways to use non-commercial net positions to conduct sentiment analysis of financial market. In the above chart, I put non-commercial net position data from last five years from 2012-2016. We can see the big picture of the changes in non-commercial net positions in last couple of years. In your analysis you can add more than five years to see the picture bigger than this. This chart can be interpreted as we interpret the RSI. So, simply when the non-commercial net position is historically low, we can predict that a bullish trend is up coming. In other way, when the non-commercial net position is historically high, we can predict that a bearish trend is up coming. These are all about reversals at the top and bottom of a market trend. But, what if the non-commercial net position is going up or down ? Generally, when the non-commercial net position is going up, it means the market sentiment is bullish, in other side, when the non-commercial net position is going down, it means the market sentiment is bearish. Is it that simple? Actually not !!! When the non commercial net position is positive figure, it indicates bullish sentiment. When the non commercial net position is negative figure, it indicates bearish sentiment. When the non commercial net position at a historical high, the market may reach a reversal at top. When the non commercial net position at a historical low, the market may reach a reversal at bottom. A sudden drop in the non commercial net position indicates a bearish trend in upcoming week. A sudden increase in the non commercial net position indicates a bullish trend in upcoming week. Dear Traders, these are the core principles to use the non commercial net position to understand the market sentiment. You may be still confused about the way to apply this analysis in practical trading. If you are not able to apply this analysis in your trading, you should wait for my next posts that will show how this analysis can be applied in practical trading. You can also subscribe yourFXguide to receive updates right into your inbox. Simply, enter your email address into the email subscription box and click subscribe, then sign into your inbox and click the confirmation link. Thank you !!! Mention me on Twitter @albab247.